So hard to believe. Times seems to just fly. Hard to describe. Well, thanks to my favorite library system, I have been able to review some new books. Ones I will not be purchasing! Pretty but nothing hit my fancy. I did like the twin set in Sensual Knits, but for the most part, not much else. This is why I love my library. I have purchased a few books with review of other knitters, only a few and found I should not have done that. We all have different tastes and ideas of what style fits us. Now back to my Clapotis! I may need to order this sweatershirt. 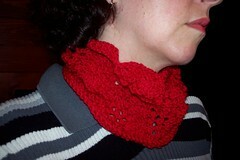 The Twelve Months till Christmas group over at Ravelry has started off with a bang. Wow. The last count was 238. Impressive to me as I thought for sure everyone would be tired of knitting/crafting for the holidays. Being ready for next year is the ticket. With the snow that was falling today, I enabled the “snow” extra with wordpress…snow will be around till January 2nd. I picked up the book “Fitted Knits” by Stefanie Japel from the library today. Thumbs Up! I’m off to amazon.com after posting this to have my very own copy. Shelley has made mention of this book on her blog and is currently working on one of the sweaters…very pretty and very Shelley. Also, picked up “Top Down Sweaters” by Doreen L. Marquart. I’m sad to say, this one gets a “thumbs down” and will not be purchased for my own knitting library. I have a few more new books I had requested from the library to peruse before I purchase for myself. It feels like that to me, at least. My allegies and daffodils are springing up as per this time of year. I am looking forward to gardening this year, having purchased many different seeds for “dyeing” purposes only. Now to figure out which raised bed to plant these in. Well, news to me this evening is the change in Editors for IK. Starting on March 15, my darling daughter #2’s 14th birthday, Ms. Jang will be editor. Enough said about that. OMG…I am sooooo happy with the new Spring 07′ Knitty. I will say, hands down, it is better than the Spring 07′ IK issue. Please don’t be offended by my comment…we don’t have the same tastes, but there were a few knitters out there that agreed with me on the new IK format. To Vogue knitting to me. SP10 is about to be started…new patterns in Knitty that I am crazy for and more fiber to buy from elann.com to handle it all. (I’m just giddy with excitement). Almost done with sock #2 of the handpaint yarn…hopefully tonight while catching another episode of Northern Exposure, Season 5. Gardening News: Yesterday with the lovely weather we had, I was able to get out and get the yard mowed. So pretty. My garlic is coming up, I have tomoto and pepper starts in the kitchen window sill, french vanilla marigolds have second leaves on them, sweet peas and more “gem” marigolds are out on their seedling warming pads in a mini greenhouse in my garden house. The rain today was a welcome event, pushing down all the bark I have laid out…showing me where I need to place more. Elizabeth over at A Mingled Yarn is very inspirational…besides all the great quotes, her fabulous knitting gets my fiber need moving along. So….with snow, rain, sun, sleet, more rain, more sun, more sun and again, lots of rain, I will be working on this little sweater. I started it last night, taking advantage of Elizabeth’s notes about doing the ribbing first instead of going back and picking up those 106 stitches called for.